From the south - Take exit 17 off the New York State Thruway ( Interstate 87). After tolls bear right onto Rt. 300 North. Stay on this road for approximately 3 miles. Stay straight to go onto Rt. 32. Follow Rt. 32 for approximately 9 miles until you reach intersection with Rt. 44/55. Turn left onto Rt. 44/55 and follow for approximately 2.5 miles into Gardiner...this is Main St. and we are on the left. We're easy to find, lots of signs and lots of parking. From the shop you can continue west on Rt. 44/55 up to the mountains....about 4 miles. Or ride the rail trail to down town New Paltz (6 miles). Or drive to New Paltz via Rt. 208 (6 miles). It's all pretty simple and we'll tell you the best way to get to where ever you want to go. From the north - Take exit 18 off the New York State Thruway (Interstate 87). After tolls take left into New Paltz (Rt. 299 west). At the main intersection in down town New Paltz (you can't miss it) take a left onto Rt. 208 South. Follow Rt. 208 for approximately 6 miles until it intersects with Rt.44/55. Take right onto 44/55 West heading towards the mountains for about 1 mile. We are on the left. Look for our sign, we're easy to find and there's lots of parking. From our shop you can continue on 44/55 up to the mountains...about 4 miles. 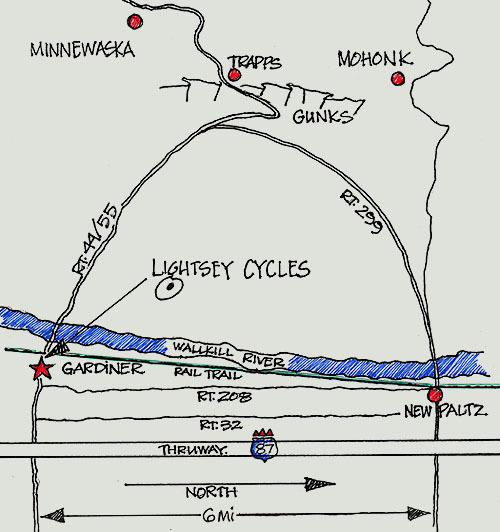 Or you could ride your bike into New Paltz on the rail trail (6 miles). 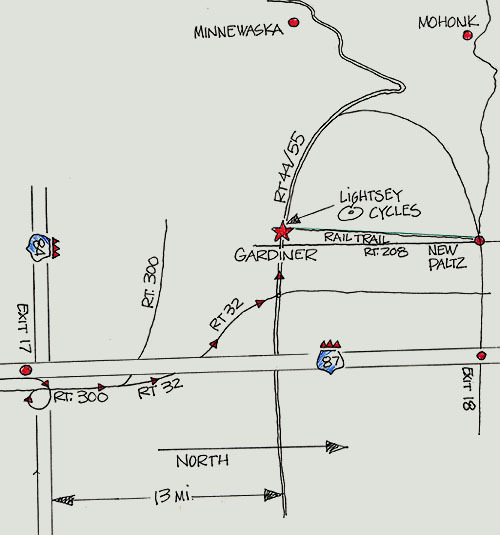 Every place is pretty easy to get to from the shop and we are more than happy to point you in the right direction. until Rt.208 intersects with 44/55 at Ireland corners. Take a right onto Rt.44/55 west heading towards the mountains. Travel apprx. 1 mile into Gardiner. You are on Main St.(44/55), Lightsey Cycles is on the left. Easy to find and plenty of parking.